This WestBred Variety has medium late maturity and is adapted well to all of Nebraska, and a majority of Kansas (except for the southeast). 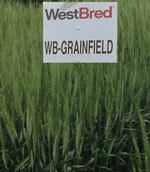 Well adapted for dryland production in western and northern area as has excellent drought tolerance. It has shown good grazing potential even under low pH conditions. It is a medium tall variety with good straw strength and very good winterhardiness.